The November Bounty Hunter event will conclude at midnight UTC time on Monday, December 9. Nice. I love Watkins Glen. I'll definitely put some time on it. I love Watkins Glen too, but with so few corners, you must nail them in order to get a good lap time. Time for some test laps. I love the Viper and the challenges it brings. From the list of T10 participants (developers/others), I could not find the gamertag "loungetoy"
The correct GT is 'Lounge Toy' with a space. That first turn is a killer. You have that large curb to the left of you, but you cant use most it. Nine targets. That’s how many Turn 10 players Forza Motorsport 7 players will be up against this month. Our latest Bounty Hunter is our biggest yet, with participants from all corners of Turn 10. Your challenge? The 2016 Dodge Viper ACR on Watkins Glen Short. The prize? How about hundreds of thousands of credits and a sweet collection of cars to add to your FM7 garage. The more Turn 10 folks you beat, the more great stuff you’ll earn. We’re kicking off this event on today’s episode of #ForzaFriday. I’ll be joined by some of our Bounty guests as they set their initial times in the event and we’ll be chit-chatting as always about the latest news in the world of Forza. Is there any place where I could find Turn 10 folks' times? I can search for them in the in-game leaderboard but it'll take much time since there is above 1100 entries. Add them as friends and they'll show up under your friends section of the leaderboard. Makes it easy to track them all in one place. When do you get the rewards? End of the month? Here are the two times I found. 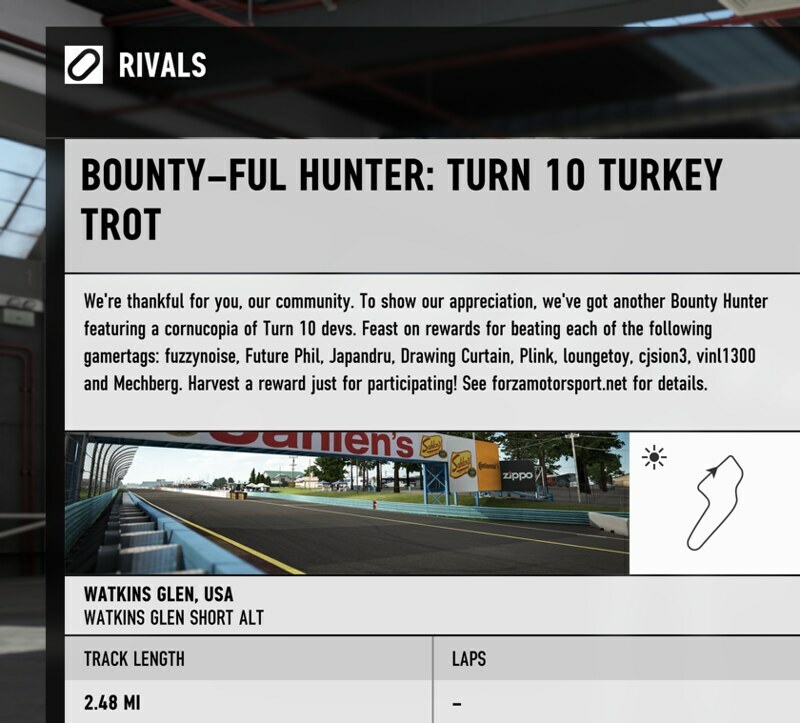 This is the first race bounty I've done (since FM4 at least) so I have a question about how it works: are the bounty times fixed at the start of the event, or might some of the T10 guys improve their times during it? I'll probably have several more goes at this during the month as it was fun, but I'm curious if I can safely tick off some of the targets as "complete". I'm shooting for that Daytona! Ran a 1:10.9 when or how do we bvb get the rewards. As far as I can tell that's faster than all the names provided. In the last Bounty Hunter event "This event shuts down on October 31 and our crew of bounties will be setting their final scores no later than October 30, giving the community a few spare hours to try and beat the targets and earn awesome prizes along the way." - 10/26 WIR So there's a good chance the event will run through the end of the month and give an extra day or two for community members to see the final times. Bounties and players both can try to improve as often as they like. Unlike Leagues where the reward is automatically provided at the end of the event, Rivals challenges with Rewards require manual tallying of the eligible winners. This can take some days after the event has closed. The deadline is TBA, but you can expect it to run through the end of the month, possibly into December. Bounties and players both can try to improve as often as they like. Scraped under 1:10 for top 3% when I did the lap, a few tenths to come off that if I can combine my best performances for each bend into a single lap. It's going to be a bit like the IndyCar oval event where a small amount of time makes a big difference to leaderboard position. The current World #1 time has to be some sort of glitch. Shows using automatic and TCS, yet it's nearly 2 full seconds faster than the World #2 time. I've been ahead of it between 2 and 4 car lengths entering the last part of the esses carrying maximum speed and in the optimum gear at full throttle, yet somehow the World #1 ghost looks as if it is shot out of a cannon once passing the final curb and disappears ahead of me almost out of sight. It looks fairly sloppy as well not even taking the best line thru turn 1. I've watched the replay, that is the glitchiest glitched time time that's ever been glitched. The car jumps from 156 mph to 208 mph coming out of the esses and slowly decelerates from there. Of course this is a glitch, even the replay do not need to watch. Oh, not the glitchiest - someone has a time of 6 seconds for COTA GP according to one of the career races I ran the other evening. Needless to say that's quite some distance ahead of second place on that LB. Unfortunately I didn't have my phone handy to grab a pic of it. Oh yeah, I saw the time of someone who's probably a lot closer to me on the leaderboards than the top of it of two seconds faster than FRC level players, just wanted to see the where/how. It was an interesting watch, though. LOL, there's some pretty bad ones for sure.